98% of the chemicals collected under the ChemClear program are used as an alternate fuel source through a range of disposal methods and technologies. The remaining 2% are Schedule X chemicals such as organochlorines, arsenics and cyanides. These chemicals are treated by either Plasma Arc technology, used as an alternate fuel source to fire cement kilns or stabilised and fixated for secure land fill. All disposal undertaken through ChemClear is in accordance with the appropriate requirements and guidance of the relevant Environmental Protection Authorities in each state. 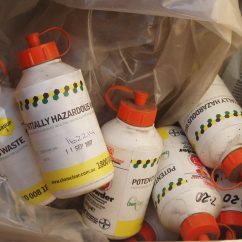 By using the national ChemClear program chemical users can truly feel safe in the knowledge that they are using the safest and most effective form of disposal available in Australia to safely dispose of these chemicals.